Leading Exporter of vertical autoclave from Ambala. Sterilizing cycle is fully automatic & controlled by Microchip Controller coupled with sensor which senses the temperature of inner chamber. Alternately displays the inner temperature of the chamber and remaining time of the current cycle. Gives alerts after every minute with single beep sound after the sterilization cycle starts. 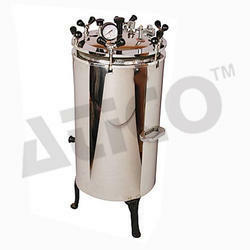 Gives the facility to increase or decrease the sterilizing time as per the requirement of the end user. Depressurizing & Unlocking the unit is manual. The working pressure for sterilization process is (15 psi -17 psi). The working Temperature for sterilization process is 121 ° C.
Looking for Vertical Autoclave ?